When Arthur and Rosalinde Gilbert decided to form a collection of post-Renaissance mosaics they were following in the footsteps of the Medicis, the Popes, the Russian Tzars and aristocrats on the Grand Tour. They soon discovered that such mosaics were a forgotten art form with virtually no publications or organised market. Their perseverance in seeking out these miracles of craftsmanship made it possible to form the only comprehensive collection of its type in the world. There are two distinct elements to the Gilbert Collection: Florentine pietre dure, or hardstone mosaics, and Roman micromosaics, ranging in date from the 17th to 20th centuries. The Florentine mosaics are made of marbles and semi-precious hardstones, carefully selected for their colour and form, which are then cut with great precision into varied sizes and shapes and set like marquetry to form decorative pictures or patterns. 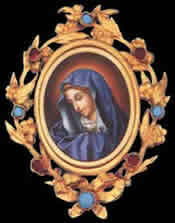 These difficult techniques were developed in the Opificio delle Pietre Dure or Grand Ducal workshops set up in Florence in 1580 under Francesco I de'Medici. During the 17th century the workshops produced some of the most magnificent luxury objects made for the great private and ecclesiastical patrons of the day. One of the first collectors of pietre dure outside Florence was the Holy Roman Emperor Rudolf II, whose court in Prague was one of the most fascinating cultural centres. He founded his own pietre dure workshop at the end of the 16th century and arguably the most significant piece in the Gilbert Collection is a collector's cabinet made for Rudolph in his workshop by the Castrucci family, circa 1610. The seven panels perfectly create the illusion of mountainous landscapes and clouded skies by the skilful selection and combination of local polished stones which are more muted in palette than Florentine examples. A magnificent pietre dure, ebony and gilt-bronze clock cabinet is a superb technical achievement made in Florence in 1704 by Giovanni Battista Foggini for Anna Maria Luisa de'Medici, Electress Palatine and daughter of Duke Cosimo III of Tuscany. The black marble face of the clock is decorated with relief carvings of floral designs in lapis lazuli, agate, jade and other semiprecious stones and embellished with superbly cast and chiselled ormolu mounts. The face panel is set into an ebony case flanked by two agate columns with gilt-bronze capitals and there is further ormolu and hardstone decoration on the case. Most of the Florentine production was devoted to cabinets and table tops which provided the best vehicles to display the virtuosity of the craftsmen. 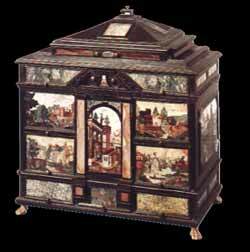 An ebony cabinet set with 19 pietre dure panels of birds and flowers on a support with floral marquetry of exotic woods is a typical example of the Grand Ducal workshops' production of the last quarter of the 17th century. However, the Workshops also produced exquisite smaller pieces including snuffboxes, bonbonnières and jewellery such as a charming gold-mounted snuffbox made around 1800 and set with six panels depicting shells and coral. Similar shell decoration can be found on a matched set of pietre dure jewellery set in gold comprising a necklace, diadem, earrings and a comb. The set originally belonged to Caroline Murat, sister of Napoleon and Queen of Naples. Hardstone panels of flowers were produced in the workshops from the 17th century onwards and a gold-mounted lapis lazuli bonbonnière, circa 1800, is inlaid with a vase of flowers on the lid and a ribbon-tied bouquet on the base. The depiction of ribbons and broken ledges began in the middle of the 18th century and continued into the next, as demonstrated on a late 19th-century table with an illusionistic still life in richly-coloured hard stones set into a deep black background. A vase of flowers and various other objects are displayed on a broken ledge. One of the last mosaic workshops in the Florentine tradition, and one that is still active, is that of the Montelatici family who specialised in genre subjects. The Gilbert Collection has a large group of hardstone pictures from the workshop including 'Return from the Market' by Mario Montelatici (1894-1974), formerly in the collection of Marjorie Merryweather Post. Micromosaic is a term coined by Arthur Gilbert to describe the technique that evolved in Rome during the late 18th century. The ancient art of mosaics flourished during the Roman Empire and the post-Constantinian period when churches in Ravenna and Byzantium were decorated with some of the most intensely spiritual images in mosaic of early Christian art. There was a revival of the art form in the 16th century as part of the plans for the decoration of the basilica of St. Peter's in Rome. Venetian mosaicists were among those who worked there and the earliest mosaic in the Gilbert Collection is a late 16th-century Venetian picture of St. Jerome. The next great period of the art of mosaics was in 18th- and 19th-century Rome when a flourishing market for views of Rome, images of ancient history and copies of well-known paintings developed in response to the Grand Tour. These mosaics differed from their ancient prototypes in being painstakingly worked with infinitely smaller tesserae of coloured glass. While earlier mosaics were made of square tesserae of stone, marble, terracotta and glass, a method of creating threads or strips of glass known as smalti filati in an increasing number of colours and shapes was invented in the Vatican Mosaic workshop during the second half of the 18th century. This microscopic technique became a new art form and the best workshops competed to produce ever more finely executed images composed of ever smaller tesserae - some containing as many as 1,400 tesserae per square inch. As a result a wide range of objects from jewellery and snuffboxes to pictures and tabletops were created, all of which are comprehensively represented in the Gilbert Collection. 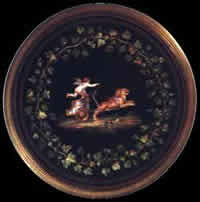 The invention of smalti filati is attributed to Giovanni Raffaelli, probably the most talented mosaicist in 18th-century Rome, and among the pieces by him in the collection is a clock, signed and dated 1804, which was presented by Pope Pius VII to Napoleon at the time of his coronation and kept by Empress Josephine at Malmaison. This masterpiece of neoclassical design and workmanship exemplifies not only great virtuosity in the carving of precious stones and in the design and fabrication of mosaics, but also in bronze casting. The timepiece itself is signed by Bréguet, the best clockmaker in Europe of the time. The earliest known micromosaic objects made on a curved surface are a pair of late 18th-century white marble and pietre dure vases, which were also in the collection of Empress Josephine. Attributed to Nicola de Vecchis, they are extraordinary in their refinement of shape and decoration, with a central frieze of micromosaics depicting two griffins with classical vases, between which are candelabra and swags of flowers carried by birds. A particularly fine table by Michelangelo Barberi is decorated with micromosaic scenes of 'The Most Beautiful Skies of Italy', 1846-51. Closely related to a table in the Hermitage made for Tzar Nicholas I, this example was probably made for Lord Kilmoran and exhibited at the Great Exhibition at Crystal Palace of 1851. Around the circumference are eight sections with characteristic scenes of important Italian cities including Rome, Florence, Milan, Naples and Venice and the centre has a group of four genii floating in the open sky. One of the grandest of all the micromosaic views of Italy is a very large panoramic view of Rome which is said to have taken twenty years to complete. It is a faithful copy of a 1765 engraving by Giuseppe Vasi of the city and although its dimensions and quality make it one of the most striking examples of early 19th-century Roman mosaics it is unsigned. Mythological scenes and copies of well-known paintings were popular subjects. Examples in the collection include Caravaggio's Entombment of Christ, signed and dated Aguatti, 1843, and George Stubbs' Tiger lying below Rocks by the Venetian mosaicist Decio Podio. Aguatti, one of the greatest of the early 19th-century mosaicists, was probably the maker of a necklace comprising nine oval plaques with landscapes of exceptional quality. Other micromosaic jewellery in the Collection includes a set with exquisite views of Rome, circa 1825, and another with plaques of flowers, fruit, birds and butterflies set in lapis lazuli frames, 1830-40. The popularity of micromosaics spread outside Italy and the Russian craftsman Georgii Wekler (1800-1861), who trained in St. Petersburg and Rome, was named 'master mosaicist' by Tzar Alexander I in 1822. Wekler developed refined and sophisticated techniques using an enormous variety of smalti filati to achieve striking effects in imitation of brushstrokes, well illustrated in the colourful feathers of a strutting cockerel in his picture after a painting by Hondecoeter. The richness of the Gilbert Collection of hardstones and micromosaics is unparalleled and the only comparable collections of pietre dure can be found in Florence while the micromosaics can only be compared with those in the Vatican and the Hermitage in St. Petersburg. The opening of the museum in Somerset House therefore made it possible to study the development of these two fascinating and neglected art forms for the first time anywhere in the world. The collection is now housed at the Victoria and Albert Museum in London. We are very grateful for Sue Bond's help in putting together this article about these amazing treasures. We understand that much of the information about the mosaics came from Jeanette Hanisee Gabriel's book "Micromosaics: The Gilbert Collection", a work which required over ten years of research. And the information on hardstone Florentine mosaics came from the volume she co-authored on that subject. Jeanette Gilbert's involvement with Sir Arthur Gilbert started at the Los Angeles County Museum of Art in 1986. She became Curator of Mosaics in 1988, and Sir Arthur's personal curator of the entire collection, in 1994. In 2002, a year after Sir Arthur died, she was made honorary curator of the Gilbert Collection, now housed at the V & A and various country houses in the U.K. Nobody knows more about this collection, or has contributed more to it than her.